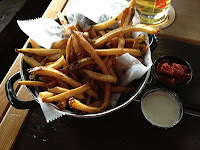 The Belgian-style fries come with your choice of dipping sauces, either one sauce with a small order ($2.50) or two sauces with a large ($3.50). My favorite is the Sriracha aioli, with other options including sweet bbq, fresh herb ranch, cucumber yogurt and curry sour cream. There is also sundried tomato ketchup. And if you like, Haus will give you your fries in poutine form, in which they are topped with gravy and cheese curds ($4 small, $5 large). My inner fat kid is sulking in the corner over the fact that I haven’t tried that concoction. Yet. 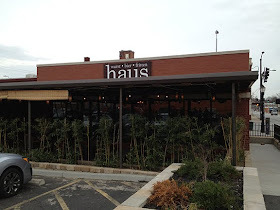 Haus serves fresh sausage from Local Pig, too. 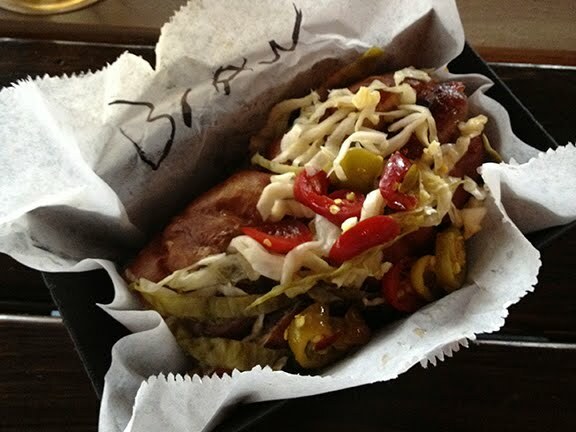 On that first visit I had the classic bratwurst topped with homestyle sauerkraut and sweet peppers ($6). 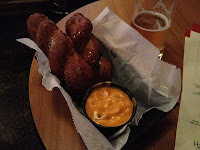 Plus, I tried all four of the different self-serve mustards -- spicy brown, classic yellow, honey Dijon and whole grain. Honestly, though, the brat was plenty delicious without doctoring it up. There are so many more gourmet sausages at Haus I want to try -- the Pork Tequila Serrano Pepper Sausage and Chicken Jalapeno & Pineapple Sausage, to name but two (gourmet sausages are $7 each). All sausages are served on a fresh pretzel bun from Farm to Market Bread Co.
Haus is how I picture the consummate beer hall, with its dark wood interior and long communal tables. Once the weather gets warmer, it’ll be nice to enjoy some open air in the beer garden. In the meantime, you can come in from the cold and feel like you’ve traveled back in time to hang out with your ancestors from the old country. Me and my Viking friends, we’ll be there, hunting gravy fries. Gotta go, gotta go, gotta go. Thanks for turning me on to this place!